What motivates us to keep going when we face our greatest challenges in life and business? You've heard of fair trade coffee and chocolate, right? Well, Helen Chantler and her husband have taken the fair trade concept to a whole new level. Their company, Reflective Images Jewelry, is the very first fair trade jeweler in the U.S. They believe what you put into your body (like coffee and chocolate) is just as important as what you put onto it. 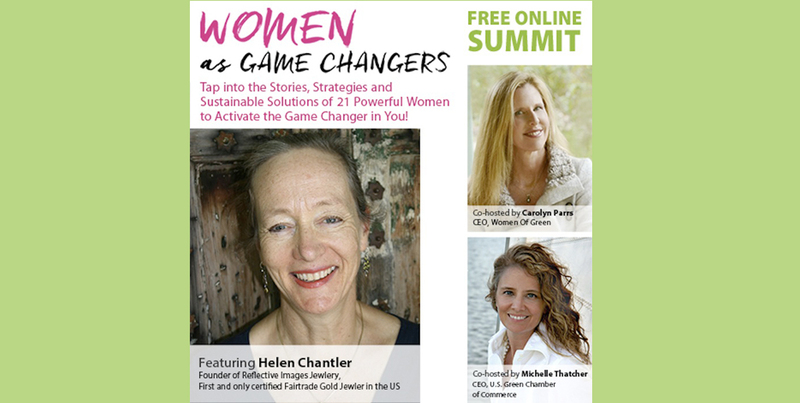 In this interview, Helen speaks candidly about her journey, the business and life wisdom she has gained as an entrepreneur and activist in a highly controlled and competitive industry. Watch this and witness a game changer in the making. -Know yourself and why you are doing the work you are doing. -Find a way to move in a direction, in your work or community life, that has a positive impact on the world. -In facing challenges that deeply trigger you, let go of personal baggage by pulling back to reconnect and see the big picture. -Powerful leadership within a business involves empowering and providing a strong support of employees and co-collaborators.